A race that began with excitement from MINI fans ends in disappointment after IMSA’s questionable call. 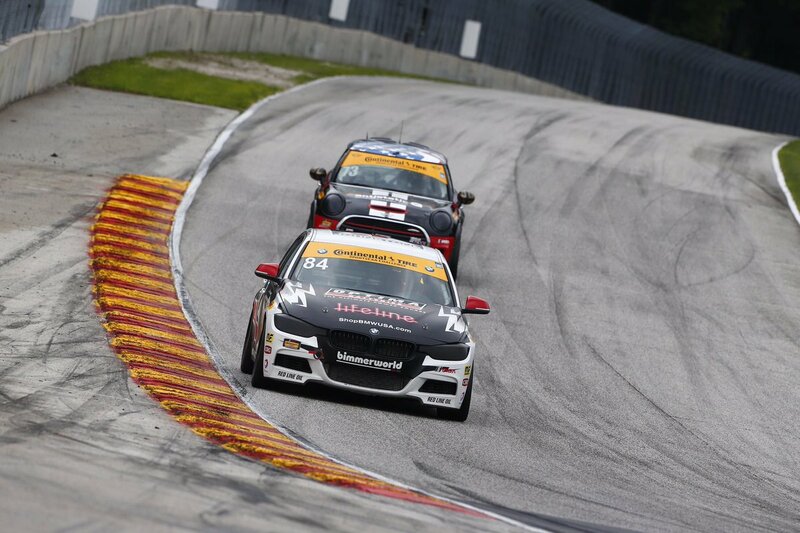 The Road America 120, round seven of the Continental Tire SportsCar Challenge (CTSC) began with light rain. The MINI JCW Team wasn’t too concerned about this though as they saw the rain as an advantage for the team. The team’s strong qualifying run meant that all three MINIs would be starting the race in the top four of the ST class. As the field took the green flag it wasn’t long before a full course yellow was displayed. The GS class #7 Ford Mustang loss traction on the damp course and hit the wall hard. The track quickly dried up from there but that didn’t seem to hamper the teams chance of a strong run. As soon as the race restarted MINI newcomer Chris Miller charged to the front from his starting position of 4th. He almost immediately got past fellow MINI drivers Mike Lamarra in the #37 and Derek Jones in the #73. The #84 BMW was under attack from Miller for less than a lap before he had to give up the position to the hard charging Miller. The MINIs were in 1st, 3rd and 5th much to the delight of MINI race fans. With the season winding down this looked like it would be a good race for the #73 to gain ground in the championship hunt. Unfortunately the championship leading #56 Porsche was also having a good day, running in 4th at the time. Nineteen minutes in and with everything looking good you knew something bad was bound to happen. Miller was holding down the lead when he had trouble in turn 5. The broadcasters weren’t sure what happened but it is believed he spun out. The #52 fell all the way back to 13th. Luckily Miller didn’t let the spin get to him. He immediately got back on top of the wheel and started charging back toward the front. Derek Jones had a fast car and was the only one able to keep tabs on the class leading #84 BMW. For more than half an hour Jones held on to second while keeping close proximity to the leader. The biggest concern came just over 50 minutes into the race. With the #84 leading and Jones in 2nd a GS class Camaro attempted to work its way past them. The Camaro cleanly got passed Jones but made contact with the BMW sending it into a spin right in front of Jones. Luckily he was able to avoid the Camaro and continue on chasing the BMW. Lamarra was having a solid run, holding steady in the top five during his stint. As the sky began to darken bad luck fell upon him. The #37 suddenly seemed to lose power, dropping him from 4th back to 7th. With cars passing him left and right he luckily was able to get the 37 moving again and back up to speed. With the race approaching the halfway point the field started pitting. Mat Pombo would take over the #73 and rejoin in 9th. James Vance entered the #37 and rejoined in 11th. The 52 would be last to pit and Nate Norenberg would take the wheel, returning to the race in 10th. As cars continued to cycle through the pits the team eventually found themselves in positions 5 (#73), 8th (#37), and 9th (#52) when the next full course yellow was displayed. The 73 with Pombo behind the wheel was in position to assume the lead when the yellow came out. The four cars in front of him had not yet pitted and would have cycled to the back of the field, putting all three MINIs in the top five. Suddenly lightning struck and the red flag was displayed with 47 minutes to go. The entire field was brought to a stop on pit lane. IMSA does not stop the clock when the red flag comes out. The minutes began to tick away as heavy rain fell onto the track. But with about 20 minutes left things had cleared up rather nicely. Safety regulations indicated that there had to be 30 minutes without lightning for the race to resume. According to race announcers that would leave somewhere between 10 – 15 minutes left of the race. It looked as if we were headed to a mad dash of a finish. But instead of a mad dash the IMSA officials called the race. The confusing and ridiculous call to end the race surprised everyone, even those currently scored as leading the race. The sky had cleared and there hadn’t been any lighting so there seemed to be no reason the race couldn’t resume. IMSA took away any chance of a good finish and probably stole a victory away from the 73. Weirdly, though it is required that both drivers of a car take a turn behind the wheel the top 4 in ST never pitted for driver changes. So how could they be scored in their positions when they hadn’t completed the mandatory driver changes? Apparently the rules were waved and those who had pitted suffered the consequences. Instead of the #73 being in postion to win, and the other JCWs fighting for a podium, they were relegated to bottom top 10 finishes. Worst of all the two cars (56 and 17) that the #73 is trying to catch in the championship standings were are among those that hadn’t pitted. The horrible call to end the race is a major blow to the #73’s championship chances. With only three races left and more points lost in this race the championship may now be out of reach. Several cars were penalized at the conclusion of the race for various infractions. This moved the #37 and #52 up one position each. Results are in the table below. Results for the full field can be found here. Next up on the calendar is the Biscuitville Grand Prix at VIRginia International Raceway on Saturday August 26th.